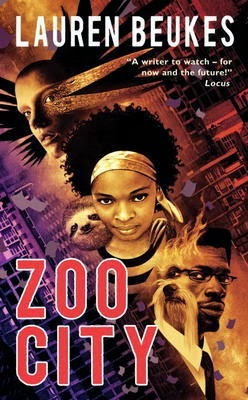 Zoo City is one of the more original, complicated fantasy books that I’ve read this year. I’m not even sure how to tag it, that’s how many elements come into play. Urban fantasy? Johannesburg is a major city, after all, and the animal angle is clearly unreal. Dystopia? Almost, but not quite; despite the animals, this is a current version of Johannesburg and African politics. Mystery noir? After all, there’s a missing person and an investigator of questionable character. Horror? A little witchcraft, a little mutilation, but mostly it’s only horror in that way that shows us our own hearts, evil enough to cut out. Literary fiction? It thoughtfully explores the human condition, guilt and identity. Mostly, it’s just interesting, creative and just a bit uncomfortable. Zinzi is currently living in Zoo City, a ghetto where the ‘animalled’ tend to cluster. She’s been dating a refugee with his own animal, a mongoose, but mostly she’s been skating under the surface, working free of her former drug debt by engaging in various computer scams, and freelancing as a finder of lost items. There’s a major client on the hook– Mrs. Luditsky has hired her to find a lost ring. Mission accomplished, she shows up to collect, only to discover a police barricade and two suspicious animalled lurking, one with a Marabou stork and one with a Maltese poodle. They have a job offer for her, one she wants to refuse, especially because it involves finding a missing person. Unfortunately, the police confiscate both the ring and Mrs. Luditsky’s down payment, leaving her severely strapped for cash. From there, the book centers around the missing-person case. Narrative was interesting, but might not work for everyone. Burkes uses Zinzi’s voice as a first person narrator the majority of the time, but intersperses other pieces of communication between chapters. Email and clippings from the newspaper’s ‘Police Files’ are the most common types, but there is also an email scam, a documentary back-story, a dictionary of terms and very moving ‘testimonials’ of the animalled from a documentary on prisons. It isn’t quite as frequent as every other chapter, and most of the time the pieces tie into the larger story. However, as they lack direct transitions, Burkes’ intention isn’t always clear, and it likely ends up increasing the distance between the reader and Zinzi. As a side note, I’ve seen people relate that this was particularly disconcerting in the audio version, so I advise consideration if you are an audio book-reader. Burke is very much of the school of fantasy writing that does not seek to explain every detail, instead encouraging the reader to build their own picture of the world. Again, this works for my own reading preference, but I know for those that like more thorough explanations, it might be a sticking point. For instance, the whole reason for Zinzi’s animal is distilled down to a drug-induced memory and a police report reference, a minor plot point that is easily missed. Burke states in a GR Q&A that she’d rather trust her readers, and I think she largely succeeds at her choices. I enjoy gathering pieces of the world as I read, particularly as it leads to high re-readability, so I find it to be a positive. In addition, Burkes makes frequent use of South African slang. Although I’m told you can find some of the words on the web, most of it works well in context, so I read without interruption. Plotting/pacing is the most serious stumble, and one of the reasons this has less than five stars. I was sailing along, enjoying the development of the mystery, wondering if Zinzi would reach an emotional breakthrough, when all of a sudden pace and tenor shifted. It occurs shortly before “Part Two,” the final section that encompasses only one hundred pages. More than a little rough in the transition, it almost seems to become almost a different story, a thriller-type race and climax. I read quickly, uncomfortably, and with puzzlement. There’s gore, a heart-pounding confrontation and an imperfect resolution. I was going to throw in more spoilery thoughts, but I’ll leave that for later–if you happened to read, please, let’s discuss. I think it’s also worth noting that Burkes, though a white South African, was able to respectfully reach outside her own experience and create a number of well-realized, complex characters from vastly different backgrounds. As I re-read for my review, I find myself lingering over the writing. I can’t get Zinzi’s tale out of my head. Remember when I wrote about dreaming of urban fantasy that pushes boundaries? This is it. Like it? Not entirely. Remember it? Definitely.